As wine, the zinfandel grape is interpreted in all sorts of ways, from playful white zinfandel to somber port. Somewhere in-between is a style fresh, frisky, lean and quaffable, but it isn’t easy to find, in large part because winemakers recognize that consumers generally expect their zinfandel to be muscular and blustery. Yet, once in a while, a winemaker will make a stab at this more accessible, refreshing and versatile style of zinfandel. Call it claret, call it Beaujolais, or call it something else. At Easton Wines in Shenandoah Valley, winemaker Bill Easton calls his “Lot 1852,” referring to the date that zinfandel arrived in California, according to wine historian Charles Sullivan. 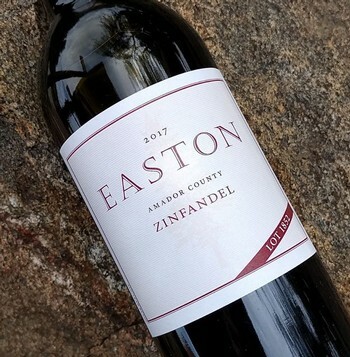 The Easton Wines 2017 Amador County “Lot 1852” Zinfandel ($22) is a positive delight — light and bright in color, lean in profile and shy in tannin, but informed with surprising substance. It also carries more suggestions of berries than generally evoked by zinfandel — raspberries, cranberries and strawberries as well as cherries. Put a little chill on it and serve it with roast chicken. Easton said he was inspired to make the wine after imagining how winemakers would have handled the grape soon after its introduction to California. “I assumed that people would want a quick-to-the-table drinkable wine and that equipment that was available to make the wine would have been primitive,” Easton said via email. Half the wine was fermented traditionally, half as whole clusters on their stems, producing a carbonic fermentation that gives the wine its youthful fragrance, fruitiness and vitality. It is zinfandel made for springtime drinking. Listen to Levi Dalton's interview of winemaker Bill Easton on I'll Drink to That! 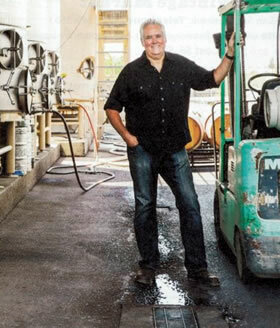 This in depth interview of Bill reveals what lurks in his mind and how he developed his personal winemaking style. Bill throws in a history lesson on California wines and how styles have evolved and returned to years past. The Wine Enthusiast, August/September Issue 92 PTS. Light copper color: pleasant, cherry and raspberry fruit aroma with a light floral note; meduim body; fleshy, red fruit flavors with firm acidity and some suppleness in the mouthfeel; lingering aftertaste. Highly recommended. 14% alc. 360 cases made; a blend of 46% Grenache, 40% Mourvèdre, 7% Roussanne, and 7% Grenache Blanc; released April 2017. 89/100points. The Wine Enthusiast, September, 2013 ~ 93 pts. has all the character of the grape without any heaviness. considering the price. (Tasted August 2014). 2010 TERRE ROUGE Syrah, Ascent – 93 pts. 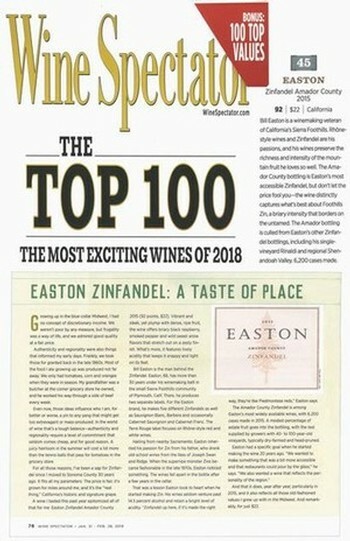 2010 EASTON Zinfandel, Estate Bottled, Shenandoah Valley, CA – 93 pts. 2010 TERRE ROUGE Syrah, Sentinel Oak Vineyard – 92 pts. 2010 EASTON Zinfandel, Rinaldi Vineyard, Fiddletown – 92 pts. 2011 TERRE ROUGE Grenache Blanc, Sierra Foothills – 91 pts. 2011 TERRE ROUGE Viognier, Fiddletown – 91 pts.